The last three weeks have been rough. I developed a horrible chest cold and nothing I took or tried to do about it seemed to help. After taking public transportation in Boston for the last 10 years and rarely getting sick, I assumed my immune system was bulletproof and getting sick in LA would be a non issue. No. I’ll spare you the details of my symptoms, which unfortunately were not alleviated by taking antibiotics I decided to try as a last resort after coughing almost nonstop for two weeks. Since I didn’t really feel like cooking that much this week, I rooted through my backlog of recipes and photos and pulled out one that I made a few times almost a year ago, and completely forgot about. Seeing the photos reminded me how delicious, colorful and, well, happy this dish is. King oyster mushroom stems are sliced and scored to create caramelized vegan scallops, which are paired with roasted cauliflower then tossed over pasta. 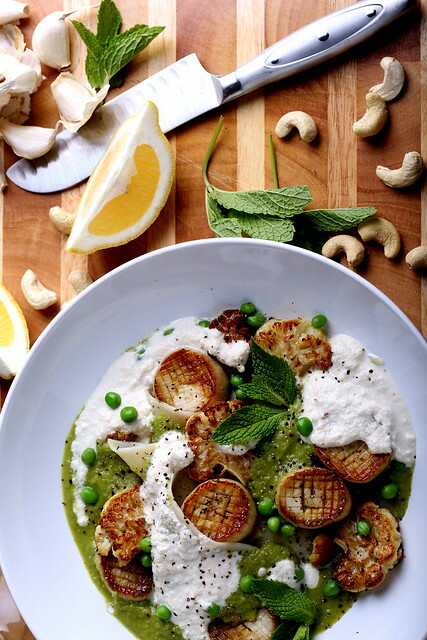 A vibrant green minted pea puree and cashew cream duo is then drizzled over the top to create a clean and creamy element, while extra peas and chopped mint gives every bite a fresh pop and crunch. 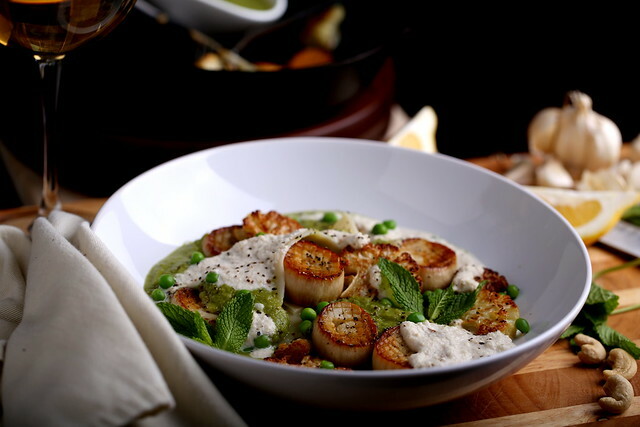 The pea puree and cashew cream here can be made beforehand and chilled, so all that’s left to do for prep is to roast the cauliflower, caramelize the vegan scallops and boil the pasta … making it a perfect, low-fuss yet luxurious dish to enjoy with friends. Heat the olive oil in a medium-sized pot over medium-low heat. Add in the garlic and shallots and sweat them for about 4 minutes, or until soft, stirring occasionally to prevent browning. Turn the heat up to medium. When the pan starts to sizzle, add in the cooking wine to deglaze the pan. Add in the peas and stir well, then slowly pour in the stock. Allow the mixture to simmer for about 5 minutes, then remove from the heat. Stir in the fresh mint, then puree in the pan with an immersion blender, or transfer to a standing blender to puree. Place the puree in the refrigerator if not using immediately. Remove the mixture from the refrigerator an hour or so to bring it to room temperature prior to serving. Preheat your oven to 400 degrees. Toss the cauliflower with the olive oil, then place on a single layer on a baking sheet. Sprinkle with the salt and pepper. Bake on one side for about 20 minutes, checking it after 15 minutes, then flip and bake the other side for an additional 15-20 minutes. Set aside. Cook the desired pasta type according to package instructions. Drain, drizzle a little olive oil over the top to prevent sticking, and set aside. Place a flat-bottomed pan over medium-high heat, then add the mushrooms, unscored side down. Cover and allow to sweat for about 4 minutes. By this time, most of the water should be expressed from the mushrooms. Drain any excess moisture completely from the pan, then drizzle about a teaspoon of the olive oil over the top. Once the bottoms are slightly caramelized around the edges, flip them over, reduce the heat to medium, then drizzle with the rest of the olive oil, allowing the scored side to caramelize. Remove the pan from the heat and set aside. Place some of the pasta into bowls, drizzling the pea puree in between the layers. 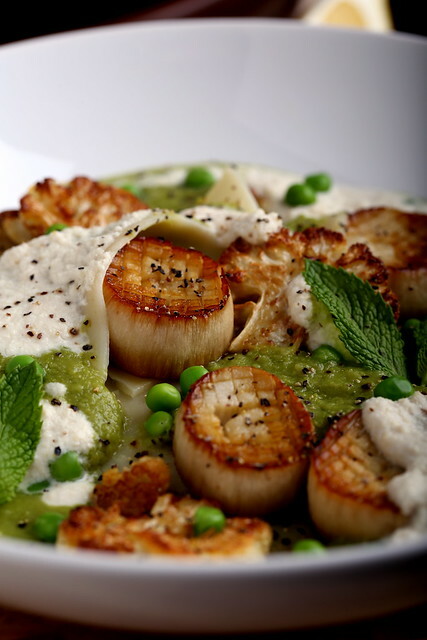 Top with the roasted cauliflower and vegan scallops, then drizzle the cream over the top. Garnish with fresh mint, reserved peas and season with the salt and pepper. what do you do with rest of the mushrooms after you've used the stems? Thanks Lan! I don't like the texture or taste of the tops of the stems, so I just chop them up and throw them into the freezer with other vegetable scraps for making stock later. 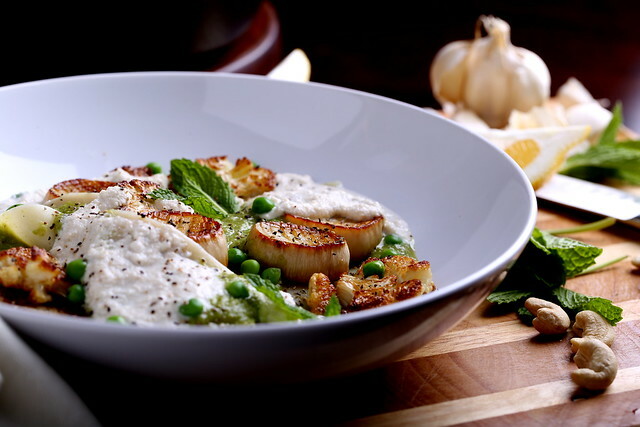 This was the recipe that got me to your blog in the first place – I was (and still am) in total awe of these vegan scallops. Take care and feel better. These look great, so pretty! So happy you liked, Shelly! I’m having a hard time finding oysters mushrooms, is there another kind that would work? I have seen trumpets mushrooms at the local market and the stems look pretty big and thick. These are beautiful, but I don’t love the look of the scoring (takes away from the authenticity, to my eye). Is it intended to help with browning the edges, or getting the inside of the stem to cook more evenly? Would the dish suffer if you omitted it? Thanks Alex. Scoring is completely optional here, and it’s mainly for visual effect, but does add a little extra texture and caramelization.